Energy-related training is much needed for SIDS to achieve sustainable development goals and reduce energy poverty. Online learning enables innovative formats of practice- centered trainings that address local needs and help overcome geographic constraints by efficiently reaching learners on remote islands. To justify high course production costs, content must be re-usable and the instructional design must match participants’ motivation, skills, capacity, and constraints. An interdisciplinary university research cooperation used SIDS survey data to develop a learner-driven, collaborative online course for energy practitioners. Problem-based learning and peer-review mechanisms were used to localize knowledge and to practice real-world skills; sustainable institutional structures assure future iterations. The pilot reached a heterogeneous audience of 1.000 learners, geographically dispersed across the main SIDS regions. Principles of learning design outlined by the authors may also be valuable for capacity-building with geographically dispersed, heterogeneous learners beyond SIDS. 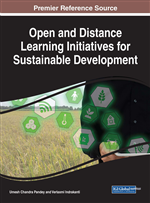 About the book: Open and Distance Learning Initiatives for Sustainable Development is a critical reference source for emerging academic perspectives on the role of higher education programs in contemporary society. Including a range of pertinent topics such as mobile learning, environmental education, and community building, this book is ideally designed for educators, researchers, students, and professionals interested in the intersection between sustainable development and education.